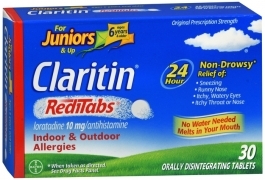 Juniors' Claritin RediTabs offer allergy and sinus relief so your kid can better enjoy their day. Perfect for little allergy-sufferers who don't like to swallow pills, no water is needed to take these tablets — just have them pop one in their mouth and wait for it to dissolve to provide fast-acting allergy relief. Non-drowsy Claritin delivers 24-hour relief from allergy symptoms like sneezing, runny nose, itchy and watery eyes, and itchy throat and nose, but without making your child groggy as they go about their day. Keep these prescription-strength allergy pills on hand for when allergy symptoms strike, especially when you don't have quick access to a beverage. Please see product insert for complete directions, indications and warnings.